As one of Auckland‘s leading kitchen design and kitchen manufacturers, at Creative Kitchens we pride ourselves on superior kitchen design, high quality workmanship and an overall professional service. Along with our experienced and professional team of kitchen designers, our kitchen design showroom offers you the opportunity to view our latest projects, discuss kitchen design ideas and gain advice on your kitchen renovation or kitchen design project. Take a look at our snapshot of recent work we’ve completed, in and around Auckland. Contact Creative Kitchens or fill in our enquiry form and we’ll get back to you. We’re the professionals when it comes to Kitchen Design, Kitchen Manufacturing and Kitchen Installation. Established in 1996 we have a great deal of experience in the kitchen design industry, we know what works. Our service and expertise, along with innovative kitchen design ideas, are what sets us apart. We guarantee to complete your kitchen design project, on time and on budget. We’ll design and manufacture a kitchen that you’ll LOVE! Often the vision of your dream kitchen is overshadowed by the reality of “where do I begin?”, along with the inevitable budget worries. At Creative Kitchens we understand that a kitchen design can be a little stressful, even challenging. We’re here to help take the pain out of your kitchen design and transform your dream kitchen into a reality. Our designers are available to meet in your home, accurately measure your kitchen, and discuss design options for a nominal fee of $ 100 + GST. We can also work directly off your plans and there is no charge for our advice if you bring those into our showroom. From measuring and planning, to choosing a layout and design, taking into consideration your wish list, we’ll take care of the details. For all you need to know about our kitchen design process, take a look at our basic step-by-step guide to designing a kitchen with Creative Kitchens. The first step is measuring up your existing kitchen space and drawing an accurate floor plan. We’ll note your existing power points, pipes in and out, as well as any existing windows and doors. How many chefs usually work in the kitchen? Do you need more space for cooking or storage? What is your style of cooking? Are you a gourmet chef or a microwave whizz? How often do you use your kitchen? Is your kitchen an entertainment area or merely somewhere to heat up quick meals? If you could splash out one one luxury item in your kitchen, what would it be? Useful to this stage of kitchen design is creating an ideas folder or portfolio; bits and pieces from magazines, websites or ideas from friends and family that appeal to you. Deciding on a layout will largely depend on the amount of space you have. You may want to make significant changes to your current layout, so using the measurements we’ve already taken and our CAD system, we’ll generate 3D images of how your new kitchen could look. Along with layout, we’ll consider the various zones in your kitchen and how best to fit these together. Each kitchen zone should have sufficient storage and worktop space; so a designated area for food preparation, cooking, serving and washing-up. A useful way of identifying the various zones is a work triangle where the sink, cooker and fridge form the three corners of the triangle in relation to each other. After all of the planning and design has been done, your wish list taken into account, kitchen zones and layout decided upon, we’ll get working on building your new kitchen. 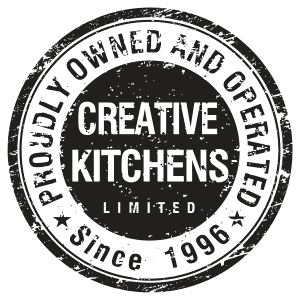 If you’re considering a new kitchen design or a kitchen renovation on your existing kitchen, contact Creative Kitchens and let our design team work with you to design and create your dream kitchen.